In 1951 Daniel R. Vos, founded Dan Vos Construction Company as a community-serving residential contractor. Since then, our company has grown into a thriving, third-generation, commercial construction firm serving throughout and beyond Michigan. Dan Vos Construction Company was established on the belief that customers deserve the best and our success and reputation are based on integrity, quality workmanship, and commitment to our employees, subcontractors and clients. We invite you to walk through the history of a family business and its legacy of service and gratitude. After being named Michigan Contractor of the Year by the American Subcontractors Association of Michigan for the fourth time, Ada-based Dan Vos Construction attributes its years of success and growth to its employees and the trustworthy relationships it builds with its clients. Daniel R. Vos started Dan Vos Construction in 1951. His grandson and current president, Dan Vos, started working for the company when he was 14 years old. “My dad simply asked me one summer if I wanted to make some money,” he said. Vos already had some experience building things for fun. He said he was always building tree forts and doing other tasks that allowed him to work with his hands. At his grandfather’s construction company, Vos’ first “real” project was building a house for his sister who was getting married the same year. He said every summer after that, every Christmas break and every day off from school, he was working. Vos studied construction management at Ferris State University before working full time at Dan Vos Construction in 1995. He started working in the field with carpentry, steel erection and other general trade skills. He also ran a few jobs as a foreman. “Then they dragged me into the office,” he said. “I didn’t really want to go into the office, but there was an opportunity to be an estimator.” Vos said his transition from fieldwork to office work was one of the better changes for him because it helped him prepare for future leadership positions. He was an estimator for two years, or “eight months too long,” by his standards. “I guess I was a little too ADD for it,” he said. He then moved into project management, which he said was probably his favorite position because of the “variety” it offered. Managing different projects gave him the chance to learn about different people’s businesses. His company works primarily with food grade manufacturers, such as ice cream, noodles and turkey processing plants, as well as some industrial clients. “You learn about each one of those businesses and how they operate,” Vos said. “You take a live turkey in this door and it comes frozen out that door, and you have an active role in that from point A to point B.” Five years ago, he assumed the role of president and CEO of the company from his father, Gary Vos, who was CEO, and Gordon DeYoung, who was president at the time. Under Vos, the company has experienced steady growth in revenue. In the past, the company generated around $50 million to $60 million annually and retained about 60 employees, which Vos said was the trend for a long time before he took over. Under his grandfather, the company earned about $10 million to $20 million. “My dad had more of a teamwork attitude than my grandpa did,” Vos said. “We grew quite a bit when my dad took over.” The company is slated to earn over $80 million in project revenue by the end of 2017, which Vos said follows a trend of steady growth from the past five years. The same trend applies to employment. The company now has 94 full-time employees and recently added another project manager, civil engineer, several field workers and steel erectors. The company also has its own design department, which Vos said is unique for a general contractor. Their area of operation spans West Michigan as far north as Big Rapids, as far south as Kalamazoo and west into the Lakeshore area. “For the area that we have, for our demographic, I think it’s a pretty good market share. I’m pretty pleased with it,” Vos said. A few years ago, the company tossed around the idea of expanding its area of operations out of state, into Indiana and Ohio, where companies were looking for design/build jobs totaling $5 million to $8 million. The company chose to turn them down because it didn’t have the resources to manage a project from that distance. “Our guys don’t like to travel. We don’t like our guys to travel. I’d rather have them home with their families at night, so we’re pretty happy where we’re at,” Vos said. Dan Vos Construction received the MCOY for the fourth time under Vos’ leadership. Ultimately, Vos attributes the success of his company to the quality of his employees. “We don’t really try to win every year,” he said. “It’s not one of our strategic plans to win the MCOY every year. It more or less just happens.” The ASAM awards the MCOY to contractors based on bid ethics, safety, job site supervision, communication administrative procedures and several other criteria to encourage the best practices in the industry. At the 2017-18 MCOY Awards, Vos told the Business Journal that ASAM has “raised the bar” for his industry as a whole. “Success for me is a happy employee,” Vos said. “Regardless of how much money we’re making … I want our people to be happy. … If they’re happy at home, they’re happy here, and that produces a better product.” Vos estimates about 96 percent of his company’s work is repeat business with previous clients. For the future, Vos said, he’s not trying to make any drastic changes in how the company operates. What’s important to him is staying rooted in the same Christian ethics and the foundation on which his company was founded. Relationships have built Dan Vos Construction since 1951, and there’s no end in sight. Dan Vos likes to point out the buildings built by Dan Vos Construction. It’s gotten to the point his wife is getting sick of it, he said. And Vos has been involved in a lot. He’s worked at Dan Vos Construction — a company his grandfather started in 1951 — since he was 14. Vos worked summers and during vacations until he graduated from Ferris State University with a degree in construction management and joined the company full time in 1995. Since then, he’s worked his way from carpenter to foreman to estimator to project manager, and now, at 40, he is the president. Through all that time, he’s worked on ensuring the foundation Dan Vos Construction was built on will always be there. The integrity upon which the company is based was a key reason Vos’ grandfather — a one-time celery farmer in Lowell — ended up building such a successful construction company. Treating employees and clients well is something Vos said will always be part of the business plan. The way Dan Vos Construction treats its subcontractors isn’t lost on the construction community. The company won its third Michigan Contractor of the Year award from the American Subcontractors Association of Michigan this month. The MCOY awards started six years ago. Vos said receiving the award is a byproduct of the company’s standards, but when the team didn’t place in the top three MCOY winners last year, he made it a point to figure out why and get better. He said putting family first is a reason Dan Vos Construction hasn’t grown like some other West Michigan construction firms. Vos said the company has turned down some projects in Iowa and Indiana that were in its “wheelhouse” because they didn’t fit within the firm’s values. “We try to stay close to home. I like our guys to be home at night with their families,” he said, adding the firm’s territory stretches from Kalamazoo to Big Rapids and from the lakeshore to Lansing. “Traveling could get us more jobs, but we’re a family-oriented company and travel is not conducive to that. Vos mentioned most construction companies in West Michigan also operate under the “maintaining strong relationships” motto, unlike some East Coast companies that “churn and burn” in survival mode. Vos does envy other firms’ projects from time to time, but then he remembers he has the same opportunities. For Dan Vos Construction, the strong relationships run through companies such as Gordon Food Service, Bissell, Wolverine World Wide and Hudsonville Ice Cream. Gordon Food Service’s new headquarters, completed in 2012, is one project the company hangs its hat on. It helped the company double its annual revenue in 2012 and 2013, before it returned to average numbers again last year. “Those years, we had GFS and two or three other large anchor jobs,” Vos said. “Those don’t come around much for us. Every job might not be a big-money opportunity, but each one is important, he said, and with every new project comes a new learning experience. “That’s one thing I love about this job: Every project we do, we learn a little bit about what other people do,” he said. “We could learn how to process turkeys one day and be at a church committee meeting the next night and a hair studio the next morning. Dan Vos Construction’s relationships helped it move through the Great Recession without too much pain, Vos said. He said technology, building techniques and the economy all change, but relationships do not. Vos said the company recently hired a new employee for business development, but he’s cautious about not ruining what’s helped make Dan Vos Construction special in the eyes of the area’s subcontractors and clients that have chosen to work with it. He’s OK with not growing too much. For a second time, family owned Dan Vos Construction Company received the award from the American Subcontractors Association of Michigan, at the fourth annual MCOY Awards on Monday night. The sold-out event was held at the Frederick Meijer Garden & Sculpture Park. Dan Vos Construction, which won the award in 2010 at the inaugural MCOY event, has been recognized every year at the MCOY awards. The MCOY winner is determined by online voting, with ASAM members scoring the candidates on their performances in 10 categories: administrative procedures, bid ethics and practice, schedule coordination, safety, jobsite supervision, communication, project relations, lien processes, payment terms and quality workmanship. With this year’s MCOY award, Dan Vos Construction will now be nominated by ASAM as a candidate for the ASA National Construction Best Practices Awards, which recognize America’s “elite” prime contractors. The Home Office was one of our largest, signature projects to date with a forward-looking vision.The Gordon Food Service “Home Office”, located at 1300 Gezon Parkway in Wyoming, Michigan broke ground in September 2011. The design, construction, and operation of the building were driven by eco-friendly strategies set forth in the Leadership in Energy and Environmental Design rating system. The 384,000-square-foot building was completed in September 2012 and serves as the company headquarters and primary workplace for over 1,200 employees. “The Gordon Food Service Home Office emulates the balance between human performance, comfort, and sustainability. Efficient design that promotes a healthy working and living environment benefits everyone—our customers, our employees, and our community,” said Jim Gordon, CEO of Gordon Food Service. The design and construction partners included Integrated Architecture and Dan Vos Construction Company. It was an honor to work with a company like Gordon Food Service, who is committed to the environment as well as its people, keeping both in mind throughout the entire process. Facilitating the project’s every detail from green roofing, geothermal heating, light harvesting, and all of its efficiency, has helped to build great teamwork between our staff, Integrated Architecture and Gordon Food Service. Daniel R. Vos, 93, passed away on Saturday, May 26 after a long life as the patriarch of Dan Vos Construction Company. During his life, Daniel developed a reputation as an honest, hard worker who believed in doing business on the basis of a trusted handshake. 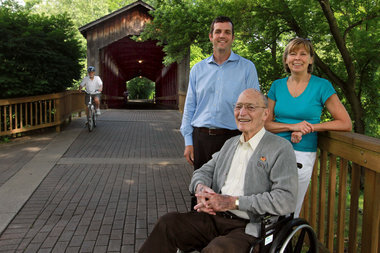 Vos was tapped by Amway co-founder Jay Van Andel in 1979 to lead the reconstruction of Ada’s historic covered bridge after the structure burned in an arson fire on Sept. 9, 1979. Going forward, Vos said he wants to continue bolstering the company’s core values, to pursue more work and to address areas in the company that need improvement. “When I look at the future of this company and the young team it has, I see a lot of great things and a lot of opportunity to increase revenue,” DeYoung said. The company is nearing completion on a 15-month-long, 380,000-square-foot project for Gordon Food Service in Grand Rapids as well as a 92,000-square-foot renovation for longtime customer Michigan Turkey Producers, also in Grand Rapids. It is because of character that DVCC is able to say that it’s been fortunate to hold the title of Contractor of the Year (COTY). Honored by the American Subcontractors Association of West Michigan (ASAM), the COTY award was created in order to give ASAM membership an opportunity to nominate and recognize general contractors or construction managers who exhibit best practices, professionalism and collaboration with Michigan’s subcontracting community. In being named by the ASAM, DVCC notes that the COTY award was given by those who work the closest with the company and often know it best: its subcontractors. This COTY award was based on the qualities and practices that DVCC holds to be the most important: bid ethics and practice, safety, jobsite supervision, communication, schedule coordination, project relations, lien processes, administrative procedures, payment terms and quality workmanship. It wasn't based on square footage, LEED building, or the number of projects awarded throughout the year; it was based on the details that DVCC emphasizes every day. The behind-the-scenes, day-to-day details that make all the difference. DVCC has not only been honored, but exceptionally proud of being named 2010’s Contractor of the Year. The company has been able to utilize this title, placing the COTY logo in various advertising campaigns, the company’s Web site and even on job sites, displayed prominently on DVCC hard hats. When Dan R. Vos got to work the morning of Sept. 10, 1979, he knew something the rest of his employees didn’t about the fire that destroyed the Ada covered bridge the night before. Their company was going to rebuild the icon. Amway co-founder Jay Van Andel had called Vos at home earlier morning with instructions. “He said, ‘Dan, start getting things lined up. We’re not going to fiddle around with this,’” said Vos, 93. “I don’t think the ashes were even cold yet. The destruction of Ada’s beloved covered bridge was a gut-punch to a proud community that had just raised $17,000 two months before to rebuild a roof that collapsed after a heavy snowfall. Dating to 1867, the village’s original covered bridge was the first of a West Michigan trio still standing and had survived flooding scares and 63 years of vehicle traffic before it was set ablaze in what was deemed an arson, although nobody was ever caught. 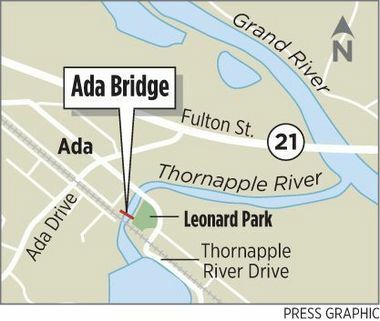 It was not in perfect shape at the time, but the 112-year-old, 125-foot long Brown Truss-style span over the Thornapple River was a village mainstay; a place for local kids to carve their initials and young lovebirds to smooch underneath. It was originally built by William Holmes and called Bradfield Bridge. It was modeled after New England spans of the time. Before it was closed to vehicles in 1930, kids would climb into the rafters to scare passing motorists. After the last day of school each year, it was a tradition to go out onto the bridge and dump ink bottles into the river. The fire reduced a proud village symbol to a smoldering heap, sagging in the river. Village residents wept at the sight. “Everybody had a little bit of their life in that bridge,” said Vos’ niece, Chris Sobota. Vos’ company was not exactly in the bridge-building business. Founded in 1951, the family business specialized in commercial and industrial construction projects. But Van Andel made clear that Vos’ company was the one for the job, he said. He told Vos that Amway’s role in the project should take a back seat to a community effort, but if the townspeople weren’t able to raise enough money, “we’ll build it anyway.”News of an anonymous benefactor leaked out in the ensuing weeks and Amway eventually was credited with the bulk of the financing, but support from others was not lacking. The county road commission chipped in. A citizens committee drummed up donations. Schoolchildren gave their nickels and dimes. Companies like Gelock Heavy Movers donated cranes, forklifts and workers for the installation of the finished replica. According to Press accounts, the bill totaled $92,000. In today’s dollars, such a project may cost more than twice that, said Dan T. Vos, grandson and current company vice president The work was overseen by longtime company foreman John Van Spronsen. Vos found the original plans, and the company created an exact replica out of Douglas fir that slid perfectly into the original footings just before Christmas in 1980. Dan T. Vos said he’s filled with pride whenever he walks though or drives by the historic span with his family. He points out to his son that their family built the structure. His grandfather said a reminder for the community is in order. Vice President Gerald R. Ford attends Amway's Groundbreaking of the Enterprise Center. The Lord's work must go on and practically the same group that built the first two rooms were at it again. On April 17, 1953 eighteen men showed up to put in the footings and this dozen and a half men were responsible for nearly all of the work. A total of thirty men helped on these two rooms. From April 17 to July 31 we had thirty four work sessions including in this there were five all day Saturdays of which three were ten hour days, and some of the men were present thirty three of the thirty four work days. Such loyalty is not soon forgotten. To help finance the school project, wheat crops were planted and the proceeds of the crops were donated to the school. The volunteers planted and harvested the crop for about 3 years. Mr. Gerritt DeGood, the well loved "SE" (Sanitary Engineer) and bus driver delivered the children to their homes. It's our personal prayer that as our school constituency continues to grow that some of the same love, loyalty, devotion and sacrifice that has been so evident in the founders of the Ada Christian school society may continue in the hearts of the teachers, parents, and pupils for many generations.